It’s been a few weeks since I’ve given you an update on Jody and often no news is good news. June was a rough month for him, spending a lot of time in and out of the hospital or home sick and on IV antibiotics. Typically when Jody finishes up a three week course of these antibiotics (assuming he’s been on the right combination of them), his energy returns and he starts feeling a little better. Usually his PFT’s (lung function studies), improve slightly as well. This go-round was no different. In July, the girls and I appreciated seeing him spend less time in bed sleeping, and more time awake and active (as active as one can be in end stage lung disease where every activity takes your breath away). One day this month the four of us even spent a relaxing day at a friends in-ground pool. Although Jody was tied to his O2 tank, he could leave it on the side and at least stand in the pool, by the edge, and get wet. The girls enjoyed having him there, even if he couldn’t swim with them, or throw them in the water like old times. That day Jody took his afternoon nap on a lounge chair under an umbrella, while the girls and I enjoyed a rare (as of late), fun summer afternoon. While it seems everyone around us is enjoying summer to the fullest, free and unhindered by disease, we are learning to be thankful for these rare days, hours, and moments when we can forget about the past and future, so full of uncertainties, and focus on the present. Moments like these are good for the soul. As the saying goes, all good things must come to an end, and this is especially true when speaking of Cystic Fibrosis. We’ve noticed a pattern for Jody where after about three weeks of IV antibiotics he starts feeling pretty good, but sadly it only lasts about three or four weeks. Soon “good” turns into “okay,” and okay turns into “lousy,” and lousy turns into a hospitalization. Yesterday Jody had a routine check-up in the CF clinic and we could classify him as being in the “okay” category. He’s been feeling a little more short of breath, his lungs are a tad more junky than normal, and his PFT’s are a little down (not quite as bad as they were in June). If left untreated, the chances are Jody will quickly move from “okay” to “lousy” and I already told you where that will land him. Hoping to prevent this, the doctor ordered oral antibiotics (in addition to the ones he takes daily to hold the chronic bacteria in his lungs at bay). She also wants him to increase his oxygen to 6L with activity (showering, taking care of our girls, climbing steps, etc.). The fact that he is now requiring 6L of O2 should bump up his score on the transplant waiting list. More oxygen requirements also means bigger, less convenient tanks for going out. We had been hoping to go out for dinner to The Cheesecake Factory at Baltimore’s Inner Harbor following Jody’s appointment, if he felt up to it. The last time we did this was a little over a year ago to celebrate a good appointment. We knew this wouldn’t be a celebration, but rather, one of those rare times when we live in the present, forgetting everything else going on in our lives, and enjoying the simple moments in life. And so we did, big oxygen tank and all! We even took a very short walk after dinner. I have been working on contentment, in suffering and in waiting, and as we stood there, overlooking the harbor, hand in hand, oxygen along side, I felt content. 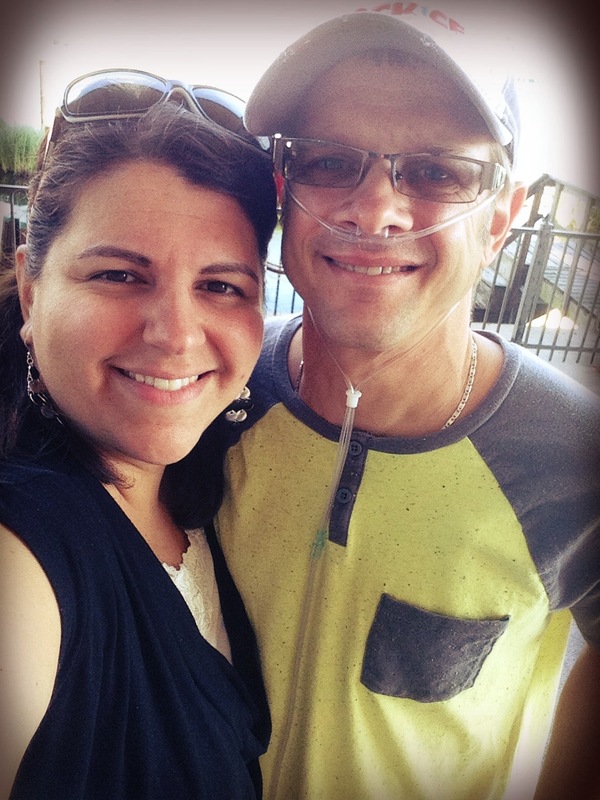 I felt thankful, for the health Jody does have, and for the oxygen tank which allowed us that moment. A positive attitude and contentment in this situation doesn’t come easy; those “lousy” days get the best of me sometimes, but I think it’s those few “good”, I mean really good, days/moments that get us through the bad. It’s also the hope that eventually, after transplant, the lousy days will be few and far between as they are replaced with days filled with pure goodness. Until that time comes, we’ll continue to relish the rare moments in our present life that make it enjoyable and endurable. I hope you will too. This was a busy week of transplant testing for us. We took three straight days and crammed them full of consults, exams, radiology studies, lab work, and more. We also threw in there PFT’s (pulmonary function testing), and a CF clinic visit. The most invasive test Jody had done was a right & left cardiac catheterization. That one took up an entire day with us not getting home from Hopkins until 10:15 pm (only to turn around and leave the next morning by 6:30 am for more testing). One thing that struck me this week is the way Jody does all of this without complaining. Some tests (such as the heart cath) caused quite a bit of pain (which although less now, he still feels), others made him feel like he couldn’t breathe, a few were just gross (like drinking barium), some required being stuck with needles, many required waiting. Not once during all of this do I remember hearing him complain! I don’t think he could say the same about me if the tables were reversed. One of the most informative things we did this week was to meet with the Transplant Coordinator. I was looking forward to this meeting because I knew she would be able to answer questions and give us more details on the transplant process. I sat there, pen and paper in hand, and by the end of our time I had a full-page of notes. It was a good meeting but it was also hard. We were talking life and death: of my husband and of a complete stranger. Tears were shed. Despite the emotions this stirs up, I was really glad for the information we gained during this consult. Jody’s CF clinic visit went well. His PFT’s (a measure of lung function) stayed the same at 28%. They may not be great but I was glad they hadn’t dropped as they have been doing over the last few months. The doctor also mentioned starting a prophylactic round of IV’s at home mid-late November to keep Jody as healthy as he can be for the upcoming holidays. I love that he brought this up and I didn’t have too. I’m so thankful for doctors who care not just about Jody’s lungs but his general well-being and the impact that this has on our family. How I would hate to wake up Christmas morning with my husband in the hospital, unable to celebrate together as a family. Obviously I know that there are no guarantees, and this could happen despite a course of home IV’s, but I’m all for the idea of doing what we can to keep him home for the holidays. While we’ve knocked out a large portion of transplant testing we are not done! I should explain that the reason for such extensive head-to-toe testing is because before they put new lungs in his body they need to make sure that he is otherwise healthy. Wouldn’t it be horrible to undergo a lung transplant only to find out you have cancer of the liver which wasn’t tested for because they assumed that with the exception of your lungs were well? That is what they want to avoid, hence the full body work-up prior to transplant. We do not have the results of Jody’s testing yet, but will be given that information once it is presented to the transplant team for review. Our hope is that anything found will be only minor and won’t hinder his ability to list for new lungs. Do you remember the last time you had a doctor’s appointment? I (and hopefully you too) have been blessed with good health, and can go years without seeing a doctor. This however, is not the case for those with Cystic Fibrosis, who are typically seen every three months or less. 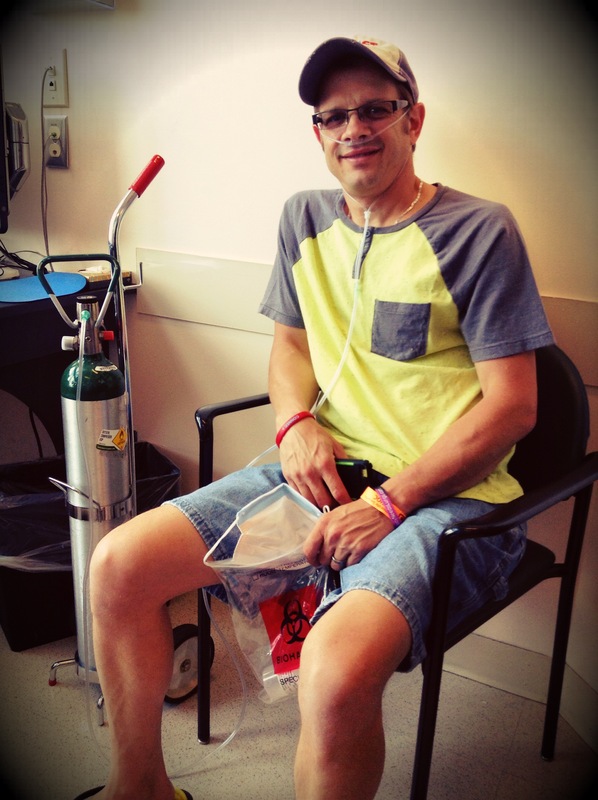 Yesterday Jody had his routine CF check-up. When I was planning for this visit I decided to take my camera along and snap some pictures throughout the appointment. 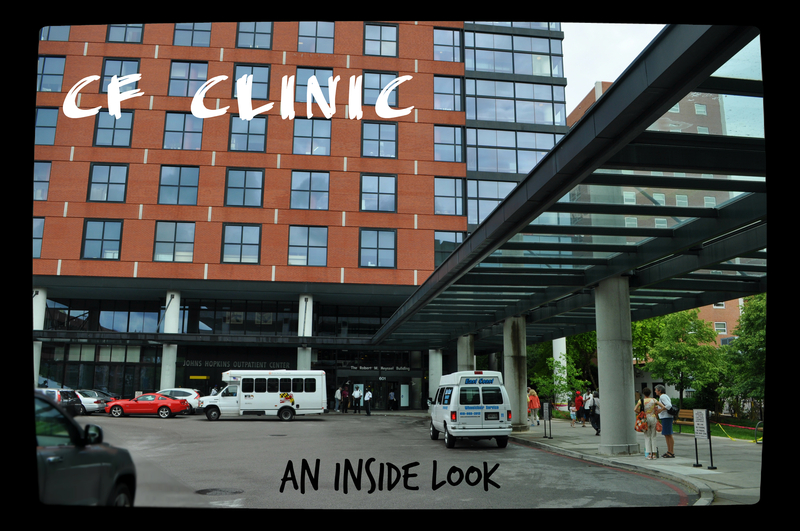 Here is your inside look at what happens during a clinic visit. Yesterday’s appointment was a good one. Jody’s weight is stable, his lung function is slightly improved, his labwork (done prior to the appointment) looked good, and overall, he’s feeling better than he has in a while. He also continues to do pulmonary rehab 2-3 times a week. We praise God for this good report and hope for many more to come! Today Jody had his first visit at the John’s Hopkins CF Clinic. During this visit we met with one of the doctors, one of the nurses, the social worker, and the dietician. I took my point and shoot camera along to snap a few pictures (isn’t a blog post always better with pictures? ), unfortunately though, the battery was dead (note to self, check the battery before leaving the house next time). Overall, Jody had a good visit today. His lung function is currently 32%, which is where he has been hanging since his infections last year. Imagine, if you or I lost 70% of our lung function we would think we were dying. 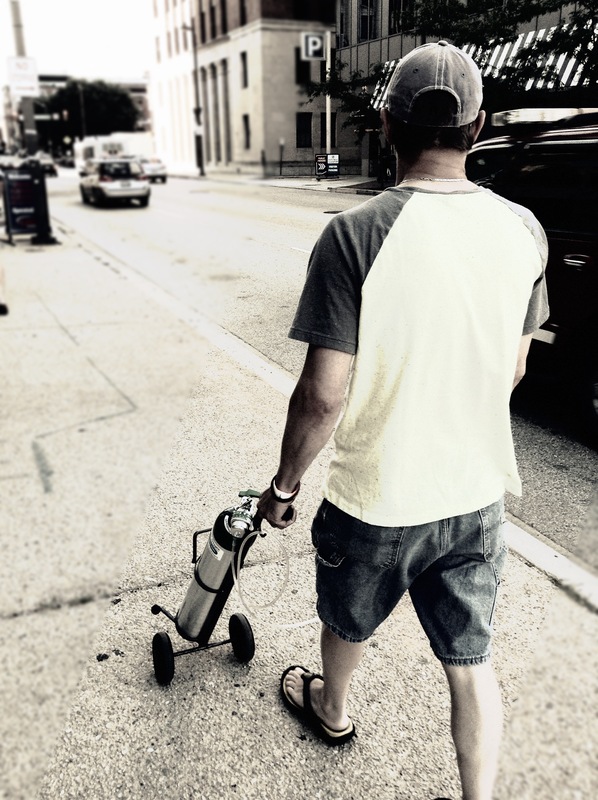 For Jody, this decline has been so slow and gradual through the years that his body has adjusted, and for the most part, this decrease has gone unnoticed… until last year that is. This past fall was the first time we began to see symptoms of his declining lungs, but we are now beginning to see small improvements. One thing the doctor today recommended is “pulmonary rehabilitation.” In plain English, supervised exercise, three times a week for 12 weeks. During the exercise session Jody’s heart and oxygen level can be closely monitored. The goal of this therapy is to start slowly, and gradually increase his exercise tolerance as his lung function (hopefully) increases. We’re not expecting to see a huge jump in function, but small increases in lung function can mean big increases in tolerance of day-to-day activities. Since we won’t be driving to Baltimore three days a week for this therapy we are hoping to get it set up here in Lancaster. Please pray that this can be done without too much hassle. We go back to Hopkins in three months, and during that visit Jody will have a full body Dexa scan done. This is a test that measures bone density, and is recommended for CF patients because of an increased risk for osteoporosis. In the meantime he will have a slew of labs drawn and we will work on setting up his pulmonary rehab. It was nice to meet some of the members of our new CF team today. We hope our relationship with them will be just as personal as it was with our previous team.